Covering the daily and weekly news in the world of professional golf can sometimes make it difficult to appreciate the smaller reasons why this game can be so great, so welcome to the Little Things, a look at aspects of the game that can sometimes go unnoticed. 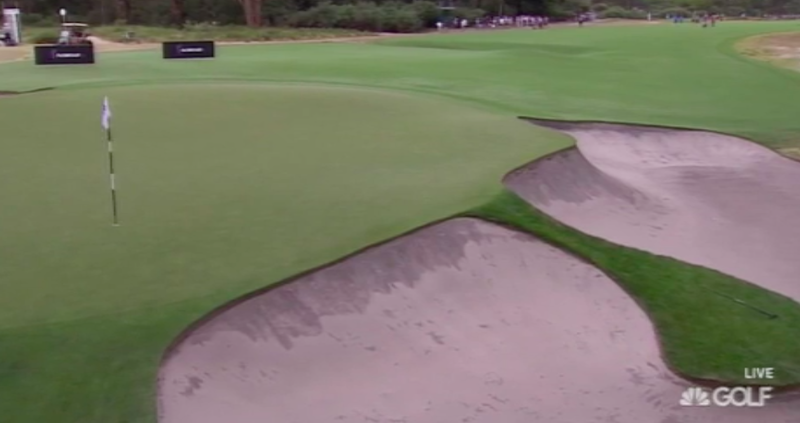 Today, I’m taking a look at the bunkering at Metropolitan Golf Club in Australia. Metropolitan enjoys a reputation as the best conditioned year round course in Australia. Prior to the 1997 Australian Open Greg Norman described Metropolitan’s pure couch grass fairways as the best he had played on anywhere in the world. During the 2001 World Match Play Championship a number of the worlds top ranked players compared the condition of the course to Augusta National. The bentgrass greens are large, firm and fast and are hand mown right to the edge of the greenside bunkers. In total there are 96 bunkers on the course and almost every hole is flanked by huge stands of Australian native trees which provide sanctuary to many species of native birds, including the noisy but beautiful Sulphur-crested Cockatoo and the multi coloured Rainbow Lorikeet. The most talked about feature on the course is the bunkering, which are hand cut into the green edges, giving it an absolutely stunning look that is pretty much never seen at any other course in the world.